We know it’s time to lighten up a bit after all that holiday indulgence. Still, last weekend in the midst of the whirling frozen stuff, we felt in need of some January cheer. We headed for lunch at Caffe Paolina, which is in a near-deserted strip mall in Swampscott and looks like it might be a coffee shop. Instead, we were greeted by Paolina herself and served fantastic Southern Italian-style food that warmed us considerably better than our supposedly waterproof boots. We decided on two starters: an antipasti ($12) and the antipasto alla Paolina and the involtino di melanzana (rolled eggplant cutlet, $5). Before they arrived, we were treated to complimentary bruschetta: firm Italian bread topped with chopped onion, tomato, and olive oil. 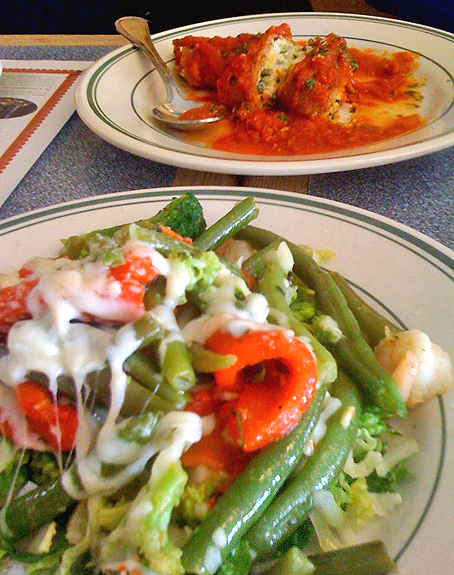 The antipasti was an interesting combination that seemed odd but tasted wonderful: lettuce accompanied by roasted peppers, cooked broccoli and green beans, shrimp, and melted cheese. The eggplant was even better: breaded and fried, filled with ricotta and spinach, and topped with warm tomato sauce. The three pasta entrees we tried were fantastic. The lasagna ($12) was an authentic version with thin sheets of pasta and a creamy béchamel rather than the heavier ricotta/thick noodles we often see. It was surrounded by a light tomato sauce a bit on the sweet side (in a good way). The fettuccini alfredo ($11) and chicken, broccoli, ziti ($12) had the same luscious cream sauce with a distinct flavor (cheese? nutmeg? ), the kind you’d return for. The broccoli was cooked through but firm, and the chicken was tender. The panini we tried, with polpette ($8), was not as good. The meatballs were bland, so the dish just fell flat. 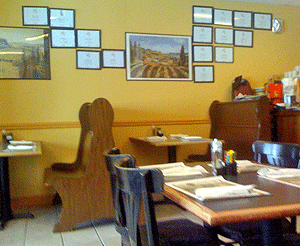 As lunch spots go, Paolina’s is not inexpensive. But the quality of the ingredients and techniques is spot on, and the pasta entrees are generous—enough to take half home if you’ve indulged in some of the Italian bread or an appetizer. And we noted that the prices on the dinner menu are quite similar: around $10 for starters, $12 to $15 for pasta, and $15 to $17 for entrees, making it a good value (it’s also BYOB). The interior décor is more café than restaurant, but with great food at reasonable prices, we don’t think anyone will mind.